In the case of the order from outside the country, bank transfer cannot be used. I am sorry. We will ship by EMS or DHL. We will ship in the way the shipping cost will be lower. If there is hope beforehand by EMS or DHL, please contact with remarks column and e-mail. Only overseas shipment can be selected. If selected by domestic shipment, we will change to courier or Yu Packet or non-standard-size mail at our shop. Payment methods available are "Credit Card" "Alipay" "Paypal". Please write the destination information in English. Delivery date and time can not be specified. The shipping cost is set for each delivery country, weight and size. When the shipping cost is decided, we will inform you by e-mail. 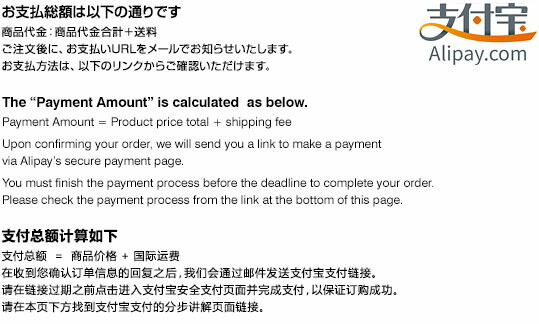 We will correct the charge to the determined shipping fee. Customs duties may be applied separately. Please pay this directly to the shipping company or customs. Since regulations vary for each country of delivery, please contact the customs authorities of the delivery destination for details. We will ship by airmail of small package of Japan Post Co.,Ltd. It can be delivered at a cheaper shipping cost than EMS or DHL, but it takes time to deliver. Max ｗeight is up to 2.00 kg. Max size is length + width + height = up to 90cm. If it exceeds it, we will change it to shipping by EMS or DHL. There is no tracking number. Because we can not track luggage, we can not compensate for loss or damage.